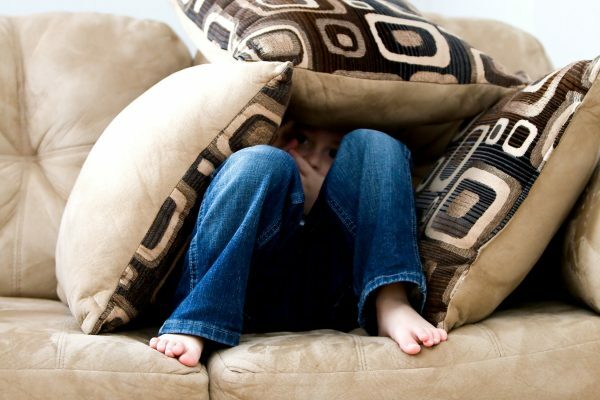 While children can be quite talkative in the privacy of their own homes, it’s not uncommon for them to be quiet in social situations in the outside world; this shyness can just be in their nature or it can be their anxiety of new people or situations getting in the way. Whatever the reason, shyness isn’t necessarily a bad thing in itself but it should be addressed if it is keeping your children from fully relaxing and enjoying being young. If you find that your child refuses to join in with social situations, clings to you or cries or hides behind you when people address them, here are a few things that you can do to help them overcome this and build their confidence so they can get involved. One of the most important things that a parent shouldn’t do is to call their child shy. Why? Because labels restrict our children and actually encourage them to behave in a certain way. To a quiet child, their behaviour is normal to them, it’s natural, so when a parent says “Oh don’t worry about him, he’s just shy,” this communicates to your child that being shy or quiet is a problem. Your child might not think of themselves as shy, but if they hear it enough times, they may think that something is wrong with them and they’ll come to believe it. Instead, consider saying “it takes him a little while to get comfortable in a new situation” or use more positives descriptions such as he’s pensive or observational. All children can shine in the right environment, so find a nursery that will encourage your child to develop socially as well as academically. The best nurseries will have programmes where the teacher-to-student ratio is no more than 1:8 and where they encourage parents and children to come in and familiarise themselves with the environment and the staff. Let the teacher know that your child is quiet in social situations so that you can come up with a plan together of how to help them feel more at ease and encourage them to get involved. It’s important that you help your child to understand and process their feelings, so try to talk about them as much as possible. Encourage them to talk about how they feel by asking them what they like and don’t like about parties or why they are quiet in social situations. By talking about their fears and having you listen, you can empathise with them and help them address their concerns so that they feel comforted. No matter how small their fears are, don’t dismiss them and try to relate to them. Say things like “sometimes, I feel shy/scared too in new situations” and tell them what works for you so they can try it too. As with most things in life, practice makes perfect and preparedness is key! To help your child practice for social situations that may make them nervous, why not try acting them out? Making games and role-playing scenarios can really help them to practice essential skills whilst spending quality time with you so it’s a win-win situation. As well as practising meeting new people or certain situations such as sharing, you can also prepare them for them. If you have a party coming up, why not arrange to take them to that friend’s house a few days before so they can get familiar with the family and the house? If they know what to expect from the day, you will find that they will be much less anxious or fearful when it comes and will be more liekly to get involved. Being quiet or shy is often associated with negative speech which can then lead to assumptions such as “other kids won’t like me” and self-doubt. This is really detrimental to a child’s development so try to avoid being negative and always think about how you can encourage and reassure your children. Teach them about different personalities and how “being normal” is subjective. Give them positive reinforcement by telling them that they are fun and praising them when they’ve done something new or gone out of their comfort zone to get involved. Remind them that they are doing great, that they’ll be okay and always talk about their strengths. Yes, they may be quiet sometimes, but that means that they are a great observer of people, that they are very aware of their surroundings and they can often relate to people and emotions better than others. When it comes to shyness or timidness in our children, it is essential that we help them learn about it so they can recognise it and overcome it. As you help your child to become more socially adept, always remind them that you’re just teaching them important life skills to help them feel comfortable, not because you wish that they were different.